My grandmother’s cups used to haunt me. Perhaps that is putting it too strongly. It would be more accurate to say that they followed me around: it was more of a stalking. I first saw them in my grandmother’s house, of course. That is where I acquired the fixed belief that such cups were hers. All of them. They seemed to follow me from ahead, however, because I used to find them everywhere I went. At some later point, I must have realised that other people happened to own the same cups as my grandmother did. Her particular cups did not transport themselves through magical means to various points in the world to appear in front of my astonished eyes in cafeterias, neighbour’s houses, offices, and once, in a bathroom. I conceded that powerful as my grandmother was she probably did not own factories in China, where these cups were made. After that, I made the careful distinction that I saw cups like those of my grandmother, and not, of course, my grandmother’s actual possessions. But still, they followed me about. Country to country, across continents, year after year. As part of a set, holding tulips, but also goat’s milk, whiskey, tea, water, porridge, or stew, depending on a seemingly infinite number of variables. These cups are very, very, common commodities, as I know perfectly well. Still, it was ridiculous how often I saw them and how diverse was the range of spaces and locations in which I used them. After all, there are a significant variety of possible cup-types in the world. It seemed unreasonable for even the most common of these, like my grandmother’s, to be quite as ubiquitous as they were.. In attempting to subvert my own suspicions that I was hallucinating these cups, eventually I started to seek them out, finding them before they could find me. Usually, I kept at least one or two in my kitchen, wherever I happened to be. I would be looking for them in a general way whenever I was thinking about buying cups. I did not make a big deal of finding them. I merely happened to stumble across them sooner or later. They are in use and for sale all over the world. It was no problem to find them in several African countries. In North America, the probability that the now-carefully engineered encounters between me and the cups would occur followed a suggestive trend of coincidences. It increased in direct proportion with the occurrence and size of immigrant populations from the Global South and decreased with their distance away. I fancied they were my grandmother’s agents, sent to check on me. 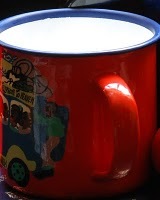 I alternated between using them every day and stowing them at the back of the cupboards, so that I would not have to use them unless every other cup and bowl in the kitchen was dirty. Finally, I made the whole problem of highly common, circulating and evocative objects a theoretical one, studied related subjects, wrote a long work on money and called it a day. Voilà: the homeopathic treatment had worked. When I was finally ready to move back home, I perceived myself perfectly free of the fetish of my grandmother’s cups. I felt no desire to own them any more, nor did I feel that the instances on which I saw/met/used cups similar to them were higher than could be considered ‘normal.’ My psyche had achieved its balance, at last. Three weeks after we arrived in Nairobi, we went shopping in preparation for a long road trip. My partner chose the cups. He bought my grandmother’s cups. A few months later, a friend gave me a birthday present for the first time. Rasna gave me my grandmother’s cups. I have six of them now. Again. I keep them at the front of the cupboard. I use them all the time.